This classification refers to the position of the first molars, and how they bite together. Why is that important? The classification of your bite also gives an indication if a skeletal discrepancy exists. It helps us determine why the bite not fitting together properly. The position of the jaws is the bony foundation of the bite. 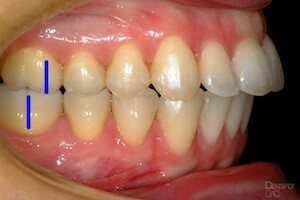 Therefore, if the jaws are not aligned the orthodontic correction becomes more complex. 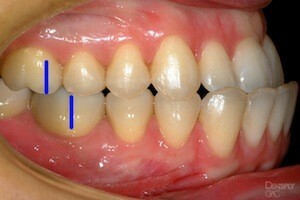 Class II is where the lower first molar is posterior (or more towards the back of the mouth) than the upper first molar. In this abnormal relationship, the upper front teeth and jaw project further forward than the lower teeth and jaw. There is a convex appearance in profile with a receding chin and lower lip. Class II problems can be due to insufficient growth of the lower jaw, an overgrowth of the upper jaw, or a combination of the two. In many cases, Class II problems are genetically inherited, and can be aggravated by environmental factors such as finger sucking. 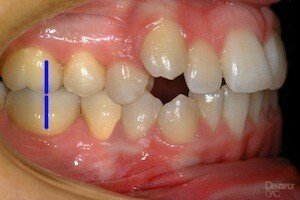 Class II problems are treated via growth redirection to bring the upper and lower teeth and jaws into harmony.